I have written about Joby’s Gorillapod Focus before. It is the perfect alternative when a tripod is not allowed. More and more places in New York City are restricting the use of tripods. I was chased out of the South Street Seaport this weekend by a security guard. A couple weeks ago, I was chased off the bleachers in Times Square. Whether it is a “real” security issue or just the property owner looking to collect a “fee”, it can be frustrating to use a tripod in NYC. Image stabilization lenses work well but not when you are trying to shooting a time-lapse sequence. That’s where the Gorillapod Focus comes in. It is smaller and less conspicuous than a tripod and most security guards have no idea what it is. It is also quicker to set-up and can easily be moved around allowing you to get in, take your photo/photos and get out with less of a hassle. 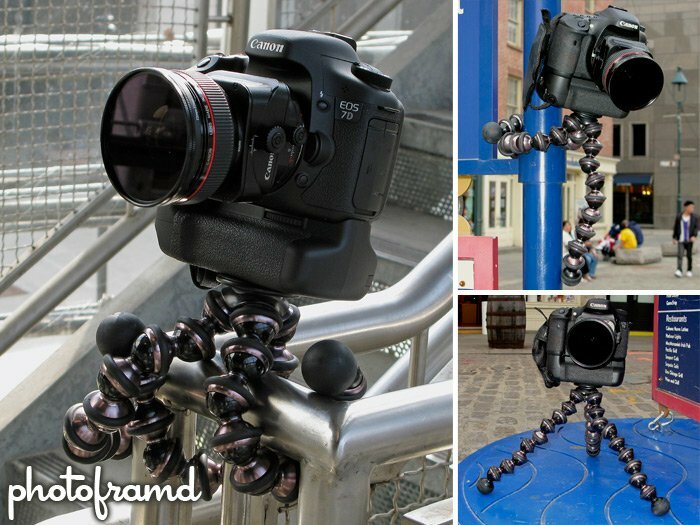 The Gorillapod Focus is made of aircraft-grade aluminum, supports up to 11 pounds but weighs a little over 1 pound. At under 1-foot long, it should even fit in your camera bag. (Remember … it bends!) As the above photos show, it can be used as a tabletop tripod or securely wrapped around a railing and even a pole. It can securely hold the Canon 7D with BG-E7 Battery Grip and a pro Canon L lens (in this case the Canon 24mm TS-E L). It is strong enough to support a tripod head; I have even used my Gitzo GH1780QR Head with it. I bought the Gorillapod Focus at PhotoPlus Expo direct from Joby when it was launched for $100, and it has proven to be a worthwhile investment. But this week, Adorama has a special on the Gorillapod Focus for my Photoframd readers for only $64.95. This is a limit time offer. ← Previous Previous post: Photoframd now on Facebook! I have a Gorillapod SLR-Zoom for about two year now. Even though it seems very handy at the time, I hardly use it. I really miss a ballhead on top as mine has a small screw, which does not fit the larger hole on my Manfrotto ballhead. I do keep it because I’m sure it can come in handy sometime. Like today, I bought a very cheap dolley for moving furniture to see how it would work with a tripod on top. For lower shots, I used the Gorillapod as a small tripod directly under the camera and that worked well. They do offer ballheads for the SLR-Zoom and have one coming for the Focus. But, if you already have a lightweight tripod head, try using that first. The Focus is stronger, so it can support more weight. Another cool use for the Gorillapod is to use it as an off-camera flash holders. Same here. I’ve been using the SLR-Zoom for nearly two years and I’m very happy with it despite it not having a ballhead. I’m not thinking to upgrade to the focus and/or by a ballhead for the Gorilla. If the SLR-Zoom is working for you, great. But, if you need something that can handle more weight, the Focus is a great option.